Grove Farm Barn has again been rewarded a Visit Britain 4 star gold award holiday accommodation. It is a traditional timber framed barn set in the grounds of the owners' beautiful timber framed farmhouse and gardens, which is surrounded by peaceful and beautiful undulating Suffolk countryside where visitors can enjoy walking and cycling through the quiet lanes, or visit the seaside towns of Southwold, Aldeburgh and Thorpness. All linen and towel provided and the under-floor heating makes it cosy in the winter. Parking for two cars. Guest have use of the grounds and can enjoy sitting around the large pond (caution is required with small children) The barn has achieved a 4 star Visit Britain Gold Award. There are 2 local pubs and a village shop within 2 miles. A welcome basket greets on your arrival. We are sorry to say we are unable to accommodate any pets at Grove Farm Barn. SHORT BREAKS FROM 3 NIGHTS AVAILABLE PLEASE ENQUIRE AND WE WILL BE MORE THAN HAPPY TO LET YOU HAVE A PRICE. SUBJECT TO AVAILABILITY AND SEASON. 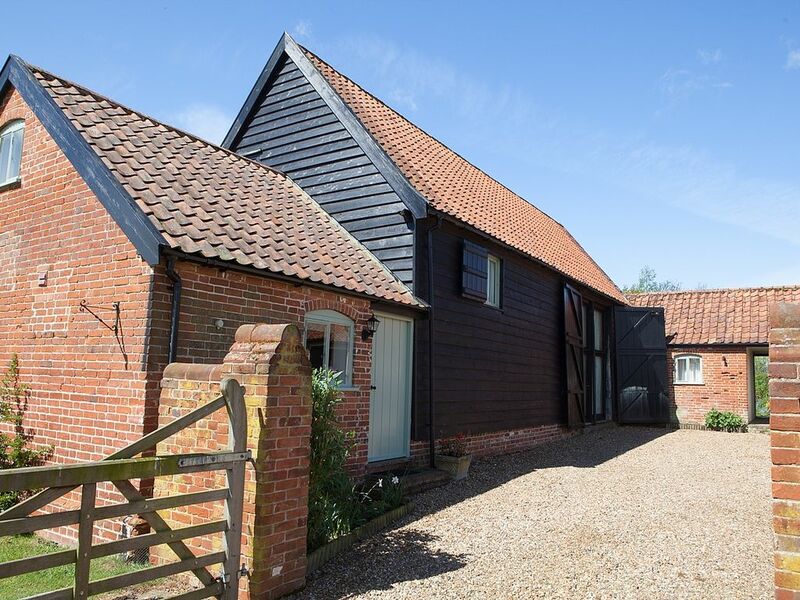 This is a traditional Suffolk Barn converted using local tradesmen. It has a stunning lounge area with exposed beams, large original barn doors and threshing as part of the heritage of this barn. It is extremely quiet and relaxing giving stunning views of the Suffolk countryside and open skies ideal for star gazing. Whilst being rural it is only 4 miles to the local town with all the amenities required and only 20 minutes from the beach at Southwold. London is only 2 hours away. WE can offer short breaks of 3 days or more subject to availability and season, please do enquire if you would like to spend a short break with us and we can confirm the rental cost. En-suite bathroom to bedroom1 with bath, wc and basin. This is situated upstairs. On the ground floor is bathroom 2 with shower cubicle, WC, basin, shaver socket and mirror. Stunning vaulted room flooded with light from the large barn doors on both sides.This room is furnished to provide two different sitting areas, one with 2 leather sofas and armchair, coffee tables with lamps. lge flat screen Freeview TV, DVD and CD. A range of stylish units provide excellent storage in this spacious kitchen/breakfast room with electric oven and hob, washing machine, dishwasher, microwave fridge and freezer, table and chairs for six. Excellent range of crockery and cooking utensils. Halesworth open golf club 5 miles, Aldeburgh, Southwold and Thorpness aslo have excellent courses. Notes on accommodation: Oil fired under floor central heating throughout making it warm and cosy in the Winter months. A unique feature is the large vaulted, beamed living area which enhances the character of the barn. Suitable for elderly as there is a downstairs shower room and twin bedroom, however there is a small step from drive to front door and from kitchen to main living area. Ideal for families as large open spaces and safe location. Outside: Landscaped gardens with large, unfenced pond, garden furniture, washing line and parking for two cars. Superb views across open countryside. Cleaning / Towels / Linen / Maid service: Duvets, linen and towels all included and changed weekly. The barn is thoroughly cleaned by us. Other: The second sitting area with a sofa is ideal for quiet contemplation, this area is separated from the dining table by open timber stud work. The elegant table and chairs will seat six people comfortably for more formal dining. Z bed can go in either room. We had a great week staying here with our 2 young children. Kerry gave us a warm welcome and showed us round. The barn is very spacious, much more so than we expected. The kitchen is well equipped and there are even toys for children. Although it’s in a rural setting, this is what we wanted, and there is plenty to do within a 30 minute drive. The vaulted ceiling in the huge living room makes this place like no other cottage we've stayed in. Beautifully maintained. Both bedrooms are very comfortable. The "gallery/mezzanine" bedroom (en-suite) over the living room has a very special feel. The living room has great space with two lounge areas and a "games end" with playstation and pool table for the kids. The pond at the rear is delightfully restful space, with the water lilies opening with the sunny aspect. Kerry was very prompt and attentive with our booking and there to greet us on arrival. A smashing place for two couples, or a family with 2/3 kids (probably not toddlers). The local village Halesworth, (7 minutes drive) had all we needed for quick shops, papers and the like. A barn and holiday that will stick in the memory. Large number of cycle routes and walking paths across suffolk countryside and Dunwich forest. Birdwatchers would enjoy the RSPB reserve at Minsmere. Day boat hire on the Norfolk Broads. 12 miles to beautiful sandy beach of Southwold with its famous pier, promenade, and home of the Adnams brewery. Sandy beaches also at nearby at Walberswick and Lowestoft. Aldeburgh a lovely coastal town and Thorpeness, famous for its boating lake are close by. Further afield are the magnificent beaches of the fabulous north Norfolk coast with the resorts of Cromer, Mundesley and Sheringham, with its steam railway. Nearest ports are Harwich and Felixstowe. Use of car recommended, but Halesworth has excellent rail and bus services. to all local towns and cities. The market town of Halesworth is 4 miles away with shops, banks, pubs and restaurants. It has a town trail pointing out all buildings of interest. It has a superb theatre and cinema complex in the town at the new cut, together with a town museum, art gallery and pretty churches. Wisset only 2 miles away has a pub with a village shop, Norman church and pretty thatched cottages. There is a vineyard where you can taste and purchase the wines. The market towns of Bungay and Beecles are nearby. Indoor swimming pool can be found at Bungay. New snooker and pool club in Halesworth. Various good restaurants and tea rooms to suite all tastes and pockets.